Hubei Province lies in the middle reach of the Yangtze River with an area of 186,000 square kilometers. Situated 108'21"-116'07" east longitude and 29'05"-33'20" north latitude, it got its name from being in the north of the Dongting Lake. 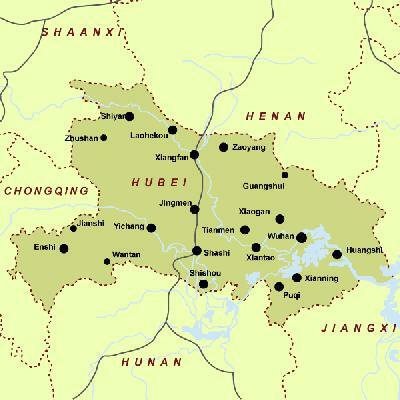 The terrain of Hubei Province is high in the west and low in the east and wide open to the south, the Jianghan Plain. The province is surrounded on three sides (east, west and north) by mountains. Its low and flat middle part is a piece of incomplete basin slightly open towards south. Of the gross area, there are 56% mountains, 24% hills and 20% lowland lake area. As to mountains, they are divided into four parts in the province. Northwestern mountains are area extending to the east by Qinling and east section of Daba Mountain. Area extending to the east by Qinling is called Wudang mountain chain, going from northwest to southeast, with lots of mountains. Altitude of ridge of mountains is generally above 1000m, and the highest is Tianzhu Peak of Wudang Mountain with altitude of 1621m. East section of Daba Mountain consists of Shennongjia, Jingshan Mountain and Wushan Mountain, with thick forests and deep river valleys. Peak of Shennongjia is Shennongding with altitude of 3105m, always known as “The First Peak in Central China”.